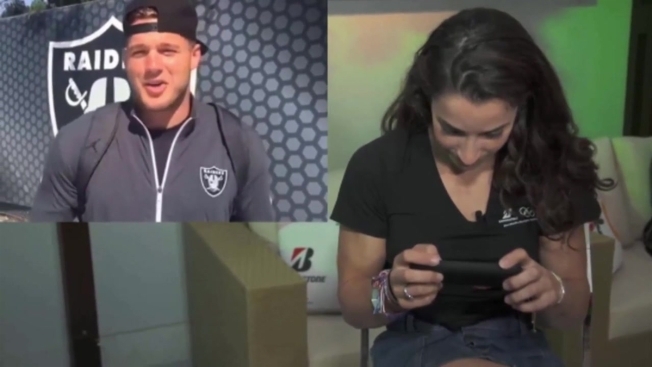 Aly Raisman caught the attention of many with her incredible performance at the Rio Olympics, especially Oakland Raiders tight end Colton Underwood, who hopes to snag a date with the gymnast the next time she’s in San Jose. In an interview with Yahoo Sports, Raisman watched a recorded video of Underwood congratulating her hard work at the Olympics, and took the opportunity to ask her out on a double date with long snapper Andrew East the next time she’s in San Jose. East also happens to be married to 2008 gold medalist Shawn Johnson, Raisman’s friend. Raisman giggled and said she would go out with him. In September, Raisman and the Final Five team will be in San Jose for their champions tour. Maybe Underwood will make an appearance and snag Raisman for that date.